I am participating in a the IMMOOC (Innovator's Mindset Massive Online Open Course) for my job and will post the five blog entries here. This is entry #2: Part 1 (chapters 1-3). 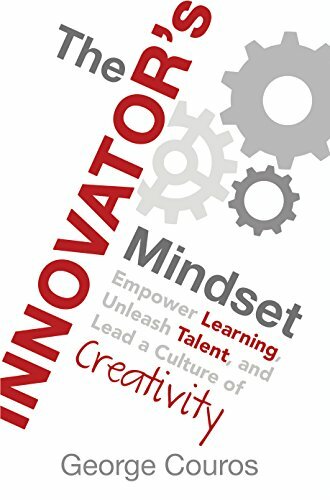 The Innovator's Mindset: Empower Learning, Unleash Talent, and Lead a Culture of Creativity by George Couros (2015) sets my brain spinning. 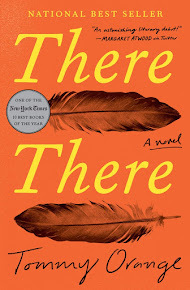 It makes me want to talk to my colleagues, have them read this book, then talk to them some more. What a great feeling. The key idea in this book is innovation so I will include George's definition here: Innovation is a way of thinking that creates something new and different. This one is going on my chalk talk for our district's next PD day! I think it's such an important question and one I've been thinking about all weekend. I left the physical social studies classroom 9 years ago and in those 9 years I've been a librarian and a tech coach. Now I work with social studies teachers and teach an online American Government course. So, I am still closely connected to the classroom. I do think I would have wanted to be a learner in my classroom. Most of the time. My students did a lot of group work, projects, with some lecture/teacher talk in between. But if I was in the physical classroom now, boy would it be even better! It would be more student-centered and self-paced with student voice and choice and at the same time more rigorous. I can't wait to hear the discussion we have around this question at our PD day. What is best for this student? What is this student's passion? Such a great question, but I think a difficult one to answer. When classroom teachers have 36 students in a class and feel pressured by standardized testing (including AP), it is difficult to focus on one student at a time. I think that's why teachers tend to think of their "class" rather than a student. How can I get this curriculum to all my students? rather than how can I make this particular student's learning the best it can be? 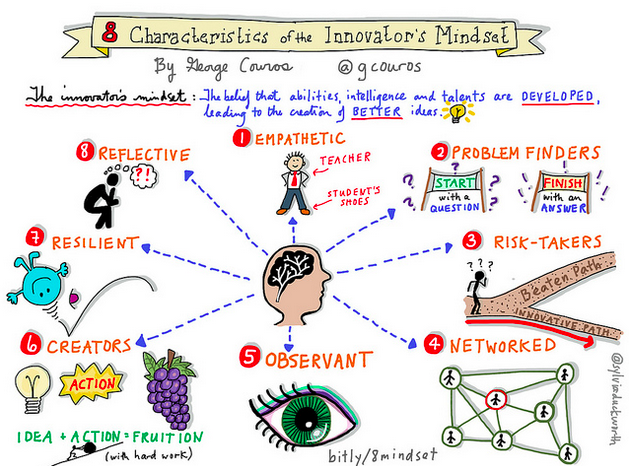 But with innovation perhaps we can change the question to focus on individuals. I think we need to. I am still struggling with this idea, but student-centered learning surely will allow students to individualize their learning experience more than we tend to do now. Instead of all students hearing the same words and information at the same time from the teacher, students can choose the aspects of a topic that interest them and use their individual talents to show us what they have learned and understand. It sounds so invigorating. How do I embody the mindset of an innovator? Hmmm. If I put myself into (or compare myself to) the eight characteristics in the fantastic image below, I see that I have glimmers of innovation. I am certainly not the visionary type, but once I get an idea, I totally run with it. I am empathetic, but wasn't until I got this social studies coach job. With curriculum I am excited to take risks and I am learning how to network. I am definitely a creator and resilient, not minding when things don't go well the first time. And I am learning to be reflective after seeing the benefits of having my students reflect on their learning. I am not good at asking the questions and finding the problems that lead to further study and I definitely need to focus on being more observant.